Nutritious, delicious whole food recipes and food know-how from Chrissy Freer, qualified nutritionist, food writer and author of Supergrains and Superlegumes. Whatever happened to eating real food? In a world of fasts and fads, whirlwind diets and mealtime anxiety, isn't it time we took back the joy of eating real, whole food and enjoyed the good health, energy and glowing vitality that can go with that? We only need to look at the increasing incidence of diabetes, food intolerances, allergies and digestive irritations and disorders to see that whatever it is we're doing to our food, it's not agreeing with us. 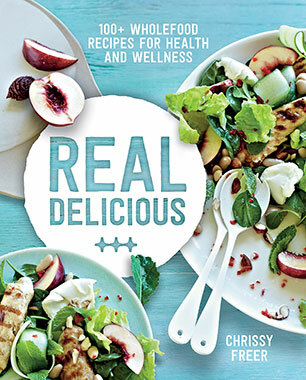 In Real Delicious, Chrissy Freer will show you how quick, easy, satisfying and invigorating it is to cook and eat real food. These are simply delicious recipes to share with family and friends for your whole life. Eat real, eat well and love it! Chrissy Freer is a nutritionist and food writer who has developed a signature style of delicious recipes with a holistic health focus. She writes for a range of magazines and websites and has two previously published books - Supergrains and Superlegumes. Her recipes use whole, unprocessed foods to provide balanced nutrition dairy-free options. Chrissy lives in the beautiful Byron Bay region with her daughter, Harriet, and loves using the area's abundant her recipe development and cooking.